Italian hard cheese of cow milk. There are two kinds, Grana Padano and Parmigiano Reggiano. The second costs about twice as much as the first. When using cheese in Italian dishes, it’s not necessary to always use the Reggiano. But sometimes you have to, like on carpaccio (the famous dish with raw beef). In some old French cookbooks Parmesan is called fromage de Milan. Pecorino is also an Italian cheese, similar in many ways to Parmesan, but made with sheep milk. Manchego is a hard cheese of sheep milk from Spain. I sincerly hope that I don’t even have to explain why you never should use packages of grated cheese in stead of grating your own. Recipe: Mushroom pasties, Mushroom Pie. A typical winter vegetable. Before the potatoe was introduced in Europe this farinaceous root was standard winter fare for many people. Parsnips do not have to be harvested, they can stay in the ground until needed. The roots are not harmed by the winter frost. You can find and eat fresh parsnips even at the end of winter and early spring. This makes them a typical lenten vegetable. Once the parsnip has been frozen, the starch in the root is partly converted to sugar. Parsnips were therefore also used in sweet dishes by those people who could not afford to buy (expensive!) sugar. The sweetness of parsnips is also enhanced by frying the roots after boiling. Recipe: Sallad of parsnips. Partridges are related to pheasants. Both are delicious fowl, much appreciated fare for the nobles since centuries. Not just because of their taste, partridge meat was excellent food to help recovering patients regaining their strength. Female partridges (hens) are tastier than males. That is because the females have a higher percentage of body fat (regrettably, the same goes for humans). The hunting season is from september to january. However, partridges are listed as a threatened or near threatened species in many countries and regions. So if you buy partridges, chose farm raised ones. They may taste ‘less wild’, but at least the wild birds are safe. Recipes: Turk’s Head, Potage à la Reyne. Sweet white wine used in recipes from Roman antiquity. The wine is sweet because of the partly dried grapes that were used for it. They have a higher sugarcontent then fresh grapes. In Italy passum-type wines are still being produced, for example the Vino Santo. Recipe: Roman Mussels, Roman patina with asparagus and quail, Roman apricots. Like humans, pigs have but one stomach (cows have several). In the meat industry pig stomach is used in sausages, but also as encasing of sausages (at least, in 1965). As I have mentioned above, it is difficult to buy a whole pig stomach. If you kill your own pig, or know people who do, here’s what to do with the stomach according to my Butcher’s Book from 1965: first of all, the stomach must be cleaned: cut away grease; make an incision in the large curvature: through this hole push out the contents of the stomach, then turn the stomch inside out. The wrinkled mucous membrane will pop out. Rinse the stomach well and steep in cold water. The next day you can peel of the mucous membrane. […] The rest, stull mucous, will be conserved in salt. (from Moderne beenhouwerij en charcuterie [Modern butcher and meat products], p.211). On the left you can see a picture of a stuffed pig stomach, with thanks to Nick Stanley. Stuffed pig stomach (saumaagen, seimaage or hogmal) is said to have been a traditional dish on Thanksgiving (November 14) with Dutch families in Pennsylvania, en in Germany this dish still is popular in the Palatinate (source). Recipe: Tasty hedgehogs. A freshwater fish (Esox lucius) that looks -at least to me- like Donald Duck: its beak resmbles the Disney bird’s bill. Pikes also swim in the canal right in front of my study. Be careful of a pike’s beak, even when lying dead on the kitchen worktop: the teeth are positioned inward, whatever enters it (for example your thumb when you try to get a better grip on the big slippery slimy fish, as I once did) will have trouble getting out. 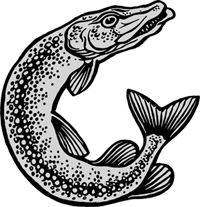 A pike has no scales, but like trout a protective layer of slime on its skin. This means you can cook it ‘au bleu’ (adding vinegar to the liquid will give the fish a blue hue if the fish is fresh). Pike is used in delicate dishes, but most people are not very fond of the fish because of the many fish bones. Moreover, a pike can taste ‘muddy’, it lives at the muddy bottom of waters, and sometimes ingests some of the mud. That is why some old cookbooks advise to keep the living pike a few days in a basin with clean water to get rid of the muddy aftertaste. Then your pike will be a real delicacy! That is also why dishes with pike were so popular in the Middle Ages on fast days. The very white meat is still loved in classic French cuisine, where it is made into quenelles (spiced and poached farce). Recipe: Pyke in galentyne. They are everywhere around the Mediterranean Sea, stone pines (Pineus pinea). When the pine cones are ripe, they open up and you can see black-brown nuts. Peel these, and you finally arrive at the creamy white pine nuts. There are many kinds of pine trees, not just in Europe and the Mediterranean, but also in Asia and North America. Some Chinese pine nuts contain a substance that alters your taste for some time in an unpleasant way. American and Mediterranean pine nuts do not have this side effect. The pine nuts of the Pineus pinea are long and narrow than Asian pine nuts, and more expensive. Pine trees have been in cultivation for millennia (about 6000 years). On this blog are great pictures, from the green, closed pine nut to the peeled pine nuts. 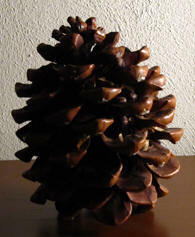 The pine cone on the picture on the left is more than twenty years old. It once fell from a pine tree to the ground, nearly hitting me, while I was on a holiday in Italy. Recipe: Genestada. Plums are drupes, like apricots and peaches. There are two ‘versions’: fresh plums, and dried prunes. Confusingly enough, the French call fresh plums prunes, and dried ones pruneaux. The famous plum pudding on the other hand is prepared not with fresh fruit but with dried prunes. In Dutch, it is simple. 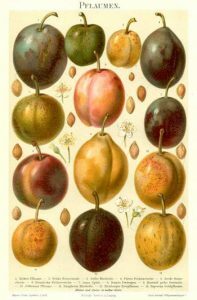 A plum is a pruim, and a prune is een gedroogde pruim (litt. ‘dried plum’). Recipe: Plum Pie. This fruit grows on a small tree (Punica granatum) that is indigenous to Iran. You eat the pulp that is surrounding the seeds. This pulp is divied by uneatable membranes that have to be removed. The pips can be swallowed or spit out, what you prefer (or whatever the custom is where you live). 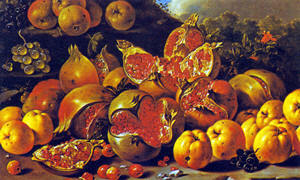 In ancient Greek mythology the pomegranate is connected to the change of seasons: because Persephone swallowed a pomegranate seed she had to remain in the underworld for a third of the year. During her stay with Hades it is winter on Earth. According to some, the apple in Paradise was a pomegranate, as was Aphrodite’s apple (which she offered to Paris, think Trojan War). The red gemstone is named after pomegranate fruit because of the colour and luminescence, the grenade (the weapon) was also named after the pomegranate because it explodes just like the seeds of the splashed fruit. Grenadine, a soft drink, originally was made from pomegranate, but nowadays it only has the name in common. From the culinary point of view only the red jelly around the seeds is used, although the seeds themselves can also be eaten. The seeds are inside seed chambers with tough inedible membranes. In the Northern hemisphere the season for pomegranates is from September to February; in the Southern hemisphere from March until May. Recipes: Potage à la Reyne, Pomegranate Salad. The French call this crépine. The caul is the part of the peritoneum attached to the stomach and to the colon and covering the intestines. You can buy it deep-frozen. To thaw a caul, put it in cold water with salt that you change once in a while. When the caul is completely thawed, you can spread it out, and see a thin membrane with veins of fat. It reminds me a bit of lace, rather attractive, actually. Why would one use a caul in the kitchen? Because it is so thin and the fat melts away in the preparation, it is ideal to wrap food in that would otherwise fall apart. And the melting fat serves as a kind of ‘instant dripping’. Use what you need of the caul, but not more. Do not wrap the caul six times around your meat because otherwise you have to throw it away, the dish won’t taste any better, on the contrary. A caul is cheap, you won’t go broke if you do not use it all. Recipes: Mortadella, Hedgehogs. This tuber, Solanum tuberosum, originates from South America. When Spanish conquerers entered a vilage from which the inhabitants had fled they found several new food stuff, including potatoes. They first thought mistakenly that the potato was a kind of truffle. 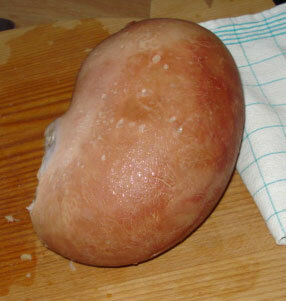 Soon after the potato was introduced in Europe, but it wasn’t an immediate succes. The bulbs were bitter, the leaves poisonous. Potatoes did not become popular food on its own merits, the consumption of potatoes was more less forced by governmental decrees and subterfuges. By the end of the eighteenth century potatoes were finally accepted, although still grumbling, by the common people. But then disaster struck: in the nineteenth century there were several disastrous famines caused by failed potato crops. Especially Ireland was victim of these famines, but Belgium and the Netherlands also suffered. One fifth of the Irish population died, and many sought refuge elsewhere: the United States of America. The famous painting The potato eaters by the Dutch painter Vincent van Gogh gives an impression of the monotony and frugality of the meals of the common people in the nineteenth century. Recipe: Herb soup with potato dumplings.